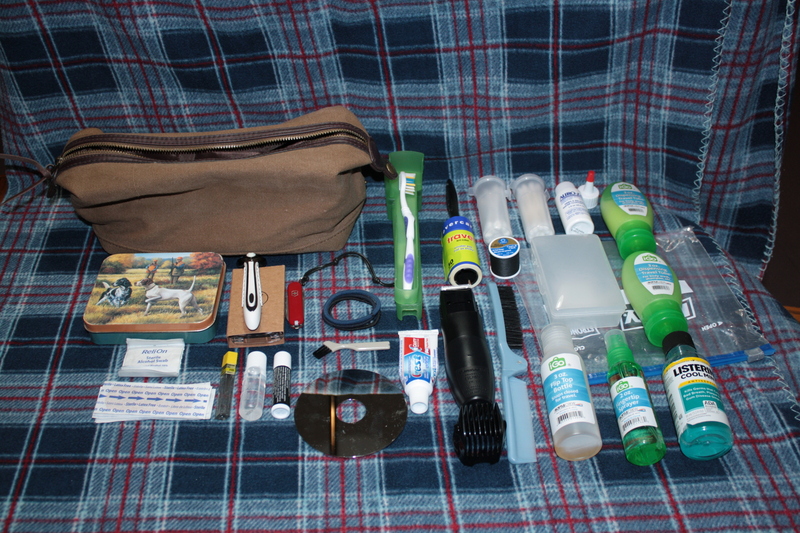 Ahh, the dopp kit. A staple of every well constructed travelling kit. If you can’t be fresh and clean after a quick shower, what’s the point of travelling? 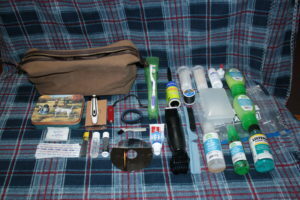 I’ve posted my kit to give those who want to travel well ideas what they should include in theirs. I’ll also include some of the reasoning behind my decisions. My last trip has introduced yet another iteration of the kit due to the experiences of that trip. I think its important to revise your kits based on your experience using them. Target Hawthorne Khaki Dopp Kit bag (which is washable). Q-tips, ear dryer fluid, soap box, baby soap for cleaning piercings, isopropyl alcohol in sprayer. Shampoo, conditioner (removed after my last trip – what hair I have left doesn’t require conditioner), mouth wash. The sewing thread and needles are in case I need to fix something up on the road. Or drain a blister, which is how I used them last. Apparently its a bad idea, but I sprayed isopopyl on everything (after taking a hot shower), threaded the blister, and then went to bed. Blister was drained when I woke up. The small tin is one I got with a wallet years ago. It keeps all the small bits together so I don’t have to worry about losing them. I actually use a hard drive platter to shave when I’m home. It hasn’t rusted yet, nor has it scratched despite being dropped numerous times over the last 6 years. Since I had some hard drives to securely delete, why not? My beard trimmer is actually powered by AA batteries. I don’t like rechargeables I can’t replace the batteries in and I don’t want to have to wait for a trimmer to charge, especially if I’m trying to road trip. Dollar Shave Club actually has pretty good razors, and they last quite awhile. If you use the link to subscribe, I’ll get a fiver out of the deal. I chose the tooth brush container based on ease of cleaning. I keep my q-tips in these containers, also from amazon. All the other toiletry stuff is from walmart. It works well enough. I dry my bar of soap before I put it away. I keep all the travel-sized fluids in the TSA-required 1 qt ziplock baggie. Not because I want to fly but to make sure nothing can leak and result in a few hours cleaning the kit from a leak a ziplock can prevent. The added bonus is that if I do have to fly, I’m ready without much effort. Anyway, this is my dopp kit. I’m not a follower of Art of Manliness on their kit. I prefer to keep my Tylenol and eye drops in my messenger bag or backpack (depending on which one I’m using). As for money, that backup should already be in your cash capsule. Personally, I think its wise to travel with about $100 in cash in a money clip. Sometimes its easier, sometimes its safer, sometimes its the palm grease you need.